The school had been the focus of a 1965 Time magazine cover story on “Today’s Teenagers,” citing the Palisades kids as examples of American youth “on the fringe of a golden era,” the vanguard of a new and better age. Medved, who would become a prominent American radio show host, author, political commentator and film critic, and Wallechinsky, the son of a Hollywood screen writer and now a populist historian and television commentator and the founder and editor-in-chief of AllGov.com, revisited thirty of their classmates for the book, which became a bestseller and later was the basis for a short-lived weekly television series by the same name. 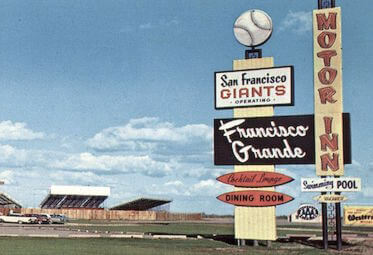 As a 1965 graduate of Lowell High School in San Francisco, the title and positive reviews caught my attention. In summer 1977, I read the book with great interest and found many similarities with my own classmates in the compelling individual stories. My article, as it appeared in the Chronicle. On a warm afternoon in June 12 years ago, 608 capped and gowned members of Lowell High School’s spring Class of 1965 walked triumphantly out of graduation ceremonies in the Civic Audito­rium and ran smack into one of the most turbulent decades in American history. Most of us perceived the ornately inscribed diplomas we received that day as our express ticket to a rosy future, to success and happiness as we knew it — college, marriage, a career, a family. Instead we clashed head-on with the Vietnam war, the draft, campus protests, the psychedelic – age, marijuana, rock music, black power, the sexual revolution, ethnic consciousness, the wom­en’s movement and Watergate. And, most of all, with ourselves — our values, our attitudes, our goals. In a cover story on America’s teenagers in January of 1965, Time magazine said high schoolers were “on the fringe of a golden era.” Teens then were brighter, better educated and more affluent, motivated and independent than ever before, Time noted. Yes, we had everything going for us. Or so it seemed. As it turned out, we may have been prepared for college, but not for society going topsy-turvy and, by the time things settled down again, not everyone from the Class of ’65 had landed right side up. During the past several weeks, I interviewed two dozen of my Lowell classmates — all of whom today are 30, or about to be — to see how they had coped with the upheaval of the late ’60s and early ’70s. Almost all of them were eager to take part in the project, and many were astonishingly candid about themselves. Dennis Marcellino, the class punk, laughing­ly revealed that he broke into Lowell one night and stole $20,000 worth of band instruments. Read Gilmore, the drama student, talked openly about his homosexuality. Tony Shonwald, the cartoonist, spoke frankly about being an alcoholic. Lani Silver, one of the “Jew­ish princesses,” told how she cast off the white gloves of a Kelly Girl to become a radical feminist. Some of those I talked to either dived or fell into the whirlpool of social change. Others never so much as got wet. Some are still searching for something that will bring stability to their lives — the right job, the best mate, more education, fewer pressures. Some are only now concluding they frittered away a lot of valuable time and they’re doing whatever is necessary to change all that — getting married, getting divorced, moving, quitting old jobs, getting new ones, going back to college, whatever. Like the 900 sophomores enter­ing Lowell this fall, we arrived at the Lake Merced campus 15 years ago excited, confused, eager, terri­fied. The ideal Lowellite then had straight hair, straight teeth and straight A’s. He or she came from an affluent home, wore the best clothes, often had plenty of spend­ing money and probably owned a car. The student population was predominantly white. They were the children of the middle and upper middle class Jewish and Protestant families who lived in the comfortable homes in the Sunset, Parkside, West Portal, St. Francis Wood, Ingleside, Stonestown and Parkmerced neighborhoods. They were exemplified in our class by the likes of Paul Batmale and Nancy Motzer, the class sweet­hearts. Paul, an All-City basketball player, and Nancy, a song girl, never dated anyone else in high school. Paul now owns Batmale’s res­taurant on West Portal avenue and Nancy works part-time as a regis­tered nurse. They have three chil­dren and live in a cozy yellow house on a tree-lined street in San Mateo. As an all academic, non-district high school. Lowell also drew the brightest kids from Chinatown, the Mission, Bayview-Hunters Point and other districts. Although minority students could compete scholastically, many felt out of place. Terry Zachery, for example, had come to Lowell to cut his gang ties in the Hunters Point. But after one semester he wanted out. Terry eventually became a star basketball player and popular rally commissioner, and as a senior was elected Student Body President in a landslide. “I don’t think it had anything to do with my being black,” he said. “I think people just respected me.” Today he is a sales agent for North American Van Lines in Van Nuys. For song girl Barbara Quan, however, jumping headlong into the Lowell social scene brought hostility from her Asian classmates, who comprised barely ten per cent of the class and therefore avoided the mainstream of student ac­tivities. “I just wanted to be in a white crowd to be accepted,” said Barba­ra, now a substitute teacher who often works at Lowell, where the Asian percentage today is 42 per cent. “But it made me a banana — yellow on the outside, white on the inside. The Asian ethic was always to just study hard and be come a professional. But I was a social butterfly. Several members of the class served with the armed forces in Vietnam, but it is not known whether any was killed. Two re­portedly died in accidents — one a car crash, the other a drowning. Of the more than 400 graduates contacted when the class reunion was held here in 1975, more than 300 attended. At that time and again in recent weeks I had the opportunity to renew many old friendships — and make some new ones. One thing was clear to me: No matter where they’ve been or where they’re going, what they wanted or what they got, who they were or are — they’ve grown up. By the time we had our 40th reunion in 2005, much had changed over the previous 28 years. I was no longer working for the Chronicle, but I proposed a freelance piece catching up on the class as we approached our senior years. I contacted several of the same classmates and some I hadn’t reached before. I was moved by their stories of success, failure, joy and tears. Even murder. Here’s my article from October 2005. 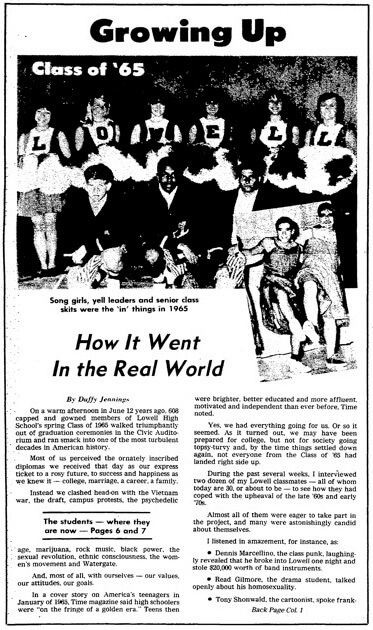 The leading-edge Baby Boomers of Lowell High School’s graduating class of 1965, fresh from celebrating our 40th reunion last weekend in San Francisco, today are reflecting on four decades of turbulence, turning points, triumph and tragedy. Once the vanguard of our innocent Beach Boys-to-Beatles generation and now at the forefront of the maturing Boomer population, again we find ourselves facing a new age, in more ways than one. The Sixties, in other words, have taken on a whole new meaning. We were the pioneer class of sophomores when Lowell’s shiny and spacious new $5 million Lake Merced campus opened in 1962, and we numbered 600-strong on graduation day three years later. More than 150 of us gathered in San Francisco last weekend to reconnect and ruminate about growing up, growing wiser and growing older. A certain denial remains, however, about the latter’s impact on skin, hair, weight and eyesight. The events included a cocktail party at Tommy’s Joynt on Friday night, dinner and dancing at the Concordia Club on Saturday night, and a picnic at Lowell’s Eucalyptus Drive campus on Sunday afternoon. 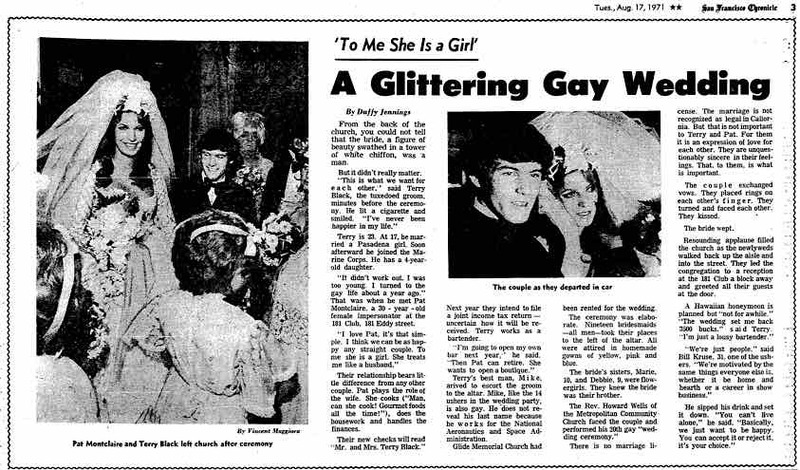 The bash was planned and carried off by class member Roberta Bleiweiss, a longtime Bay Area event producer and a co-founder of Beach Blanket Babylon with her sister, Nancy, and Steve Silver, a 1962 Lowell grad. The camaraderie of the high school experience lives on at reunions, but over time the topics of conversation have changed from college, career, weddings and children to kids in college, retirement, multiple marriages and grandchildren. Not to mention aging parents, financial security, health care and even our own mortality. Illness and accidents have taken their toll. At least 16 of us are already gone. — Chuck Lindner, a Santa Monica attorney who helped Johnnie Cochran write the closing arguments for the defense in the murder trial of O.J. Simpson — 30 years after Lindner tackled “The Juice” in a football game between Lowell and Galileo high. But Lindner’s football career came to an abrupt end — a cancerous knee led to amputation of his left leg in college. — Randy “Gus” Koernig, a 57-year-old father of a class-record nine kids and a grandfather of 12 who, as a TV newsman in Montana, anchored the only nationally televised town hall meeting with President Bill Clinton, rode with the Blue Angels and reported from Russia on the collapse of the Soviet Union. And one day in 1991, while covering a fatal hiking accident in the Bear Tooth Mountains, he was stunned to learn that the victim was one of our classmates, Chuck Root. — Marilyn Sherman Ellis, a Southern California high school Spanish teacher who became a national advocate against drunken driving after a drunk driver killed her 22-year daughter in a crash eight years ago. More recently, Ellis has battled breast cancer. — Terry Zachery, the charismatic student body president who shot and killed a Los Angeles County deputy sheriff with the officer’s gun after a routine traffic stop on the I-5 Grapevine in Gorman in 1978. Zachery was apparently under the influence of PCP when Deputy Arthur Pelino took him to the substation. When Pelino, who lived behind the substation, failed to come home for dinner, two of his children went to the substation, where they found their father dead on the floor and Zachery seated quietly in a chair. The children ran back to get Mrs. Pelino, who escorted Zachery into a cell and called for help. According to newspaper reports, Zachery pleaded guilty to involuntary manslaughter due to his mental state and served five years for the shooting. — Dennis Marcellino, a rock musician with Sly & The Family Stone, The Tokens and 3 Dog Night who turned from a near-suicidal period of abusing drugs, gambling and alcohol to Christianity when he “realized the Bible was true” and found inner peace. — Paul Batmale and Nancy Motzer, Lowell sweethearts who married at 21, had three children, divorced shortly before our 25th reunion in 1991, then remarried before the 30th. Today they have six grandchildren. Instead, we clashed head-on with the Vietnam War, the draft, campus protests, the psychedelic age, marijuana, rock music, black power, the sexual revolution, the women’s movement and Watergate. And most of all, with ourselves — our values, our attitudes, our goals. Teens of the mid-1960s, according to a Time magazine cover story at the time, were “on the fringe of a golden era” — brighter, better educated and more affluent, motivated and independent than ever before. Supreme Court Justice Stephen Breyer (’55), actress Carol Channing (’38), Yale University President Richard Levin (’64), former California Governor Edmund G. (Pat) Brown (’23), actor Benjamin Bratt (’82), Chronicle columnist Art Hoppe (’42), Pierre Salinger, network TV journalist and John F. Kennedy’s presidential press secretary (’41), “Gorillas in the Mist” scientist Dian Fossey (’49), actor Bill Bixby (’52), author Irving Stone (’20), Bob Lee, three-time Minnesota Vikings Super Bowl quarterback (’63) and “Lemony Snicket” creator Daniel Handler (’88). Many Lowell grads, encouraged toward independent thought by the times and the setting, were spurred to a philosophy of social change. At 20, when Lani Silver’s priority in life was finding a husband and wondering “what color my bridesmaids’ dresses would be,” her parents took her to South Africa, where the poverty and despair she witnessed in one short afternoon drive through Soweto transformed her. In the 1977 article, Silver lamented a world “falling apart” with violence against women, pollution, unemployment, corporate indifference and injustice. Not much has changed, in her view. Paul Batmale, a star basketball player at Lowell whose father, Louis Batmale, was the longtime chancellor of City College of San Francisco, and Nancy Motzer, a popular singer, personified the popular group in high school to which many adolescents aspire. Today the Batmales, the high school sweethearts who divorced and remarried, live in Auburn (Placer County), where he is an insurance broker with former 49ers quarterback Y.A. Tittle, and she is an executive with Kaiser in Sacramento. For Marilyn Sherman, the post-Lowell path was predictable and happy — for a time. A UCLA grad with a teaching credential, she met and married Sy Ellis, and they had two daughters, Kim and Amy. Then, on the night of December 9, 1997, their lives changed forever. Kim, then a 22-year-old Pepperdine University law student on a break from finals, was driving on the Pacific Coast Highway when a drunk driver plowed head-on into her car, killing Kim and another young woman and injuring two other passengers. The driver, who had prior offenses, is now serving 18 years-to-life in prison. Rather than cave in to debilitating depression, Ellis coped with her loss by forming a chapter of Students Against Destructive Decisions at her school, speaking at national conventions, organizing “Every 15 Minutes” drunken-driving awareness programs at schools, and supporting Mothers Against Drunk Driving events. “When you lose your parents, you lose your past. But when you lose your children, you lose your future,” said Ellis, who teaches Spanish at Sierra Vista High School. Her husband of 36 years is a mortgage banker. That attitude typifies the outlook of many Baby Boomers today, the notion that life has been a collection of learning experiences, defining moments, rewarding work and precious memories. And that there is much more to come. Some have retired while others are reinventing themselves and even now beginning new careers. Some are financially secure and others have failed to prepare adequately for their retirement years. Some married young, some often, some only recently. Some have grandchildren, some have infant children, some have no children. One thing this particular group of Baby Boomers will always have in common, however, is their time together at Lowell.